This essay originally appeared in the now-defunct Maura Magazine on March 15, 2015 (issue #44), along with Allison’s Felus’s essay on The Lilys’ Eccsame the Photon Band, another classic album recorded at Studio .45. I know Joe Pernice and his brother Bob had nothing to do with those last two lines. They’re not part of the liner notes, and they have nothing to do with the songs. But I read those two lines of legalese in the same spirit as I hear the first line of “Crestfallen”: a voice from the past that I recognize only when I surrender to it. 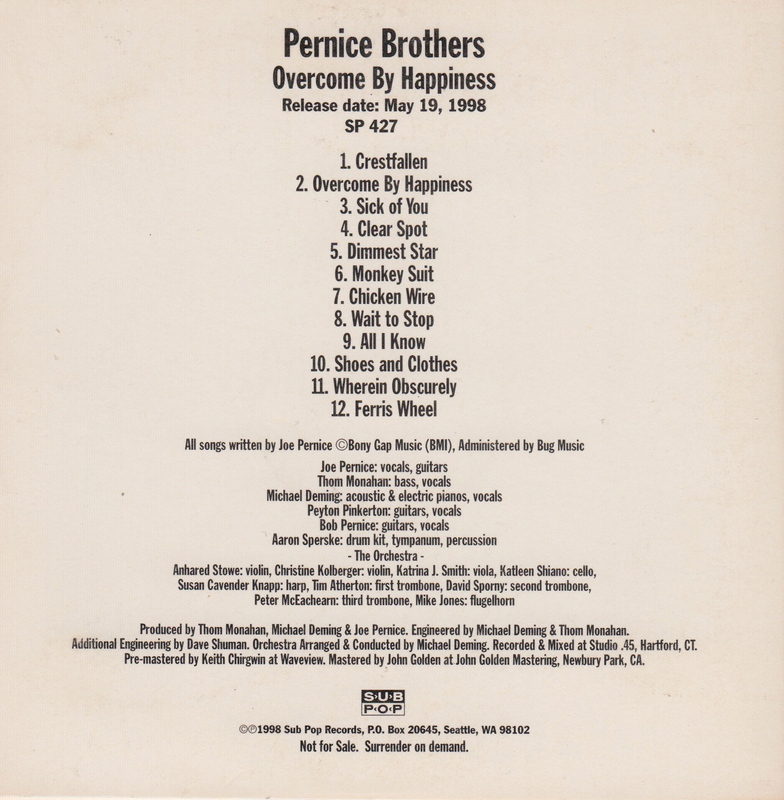 When I listen to Overcome by Happiness—a record I didn’t own in 1998 and didn’t hear until 2014 when Allison suggested I listen to it—I hear the other records and songs produced by Mike Deming at Studio .45 in Hartford, Connecticut. Seattle and Chicago produced some of the most popular bands of the 1990s, but Connecticut and Western Massachusetts produced some of the decade’s best music, and a lot of it came from Deming’s studio: listen to Monsterland’s “Jane Wiedlin Used to Be a Go-Go As Far As We Know” from the Danbury, Connecticut band’s 1994 EP At One with Time, or “High Writer at Home” from the Lilys’ Eccsame the Photon Band. Thom Monahan, incidentally, co-producer and bassist for Overcome by Happiness, was also the bassist and co-vocalist for Monsterland. While you’d never confuse Joe Pernice’s mellifluous voice and sparkling melodies for Monsterland’s aggressive, often dissonant, Mission of Burma meets My Bloody Valentine sensibility, and while Eccsame the Photon Band at times sound like Lush covering The Dark Side of the Moon, what all three share in common is a specific sense of motion. Records made at Studio .45 have an openness, not just in the words but also in the sounds. There’s space to move in these records, but it’s the slow, circular movement of a drive through New England, past the rusted, abandoned factories of Bridgeport and Waterbury, Connecticut through the poverty of New Haven and Hartford and onward to the opulence of their rich suburbs. It’s the sound of poet Wallace Stevens, walking to his office at the Hartford Accident and Indemnity Company, but it’s also the voice of Taj Mahal, who was born in New York but spent his early years in Springfield, Massachusetts, just a few miles south of Northampton, where Joe Pernice formed his other band, the Scud Mountain Boys. In New England, especially, Connecticut, we love the blues. The Scuds, as we used to call them, released an album with Sub Pop, too, just two years before Overcome by Happiness. It was called Massachusetts. I’m glad I only heard Overcome by Happiness a year ago. If I’d heard it in 1998, I’d be locked into specific memories of that year, when I was living just outside of Storrs, Connecticut. I’d remember driving from Storrs to Northampton, or I’d think about the gigs my band was playing at The Bay State or The Russian Lady or Gronion’s. 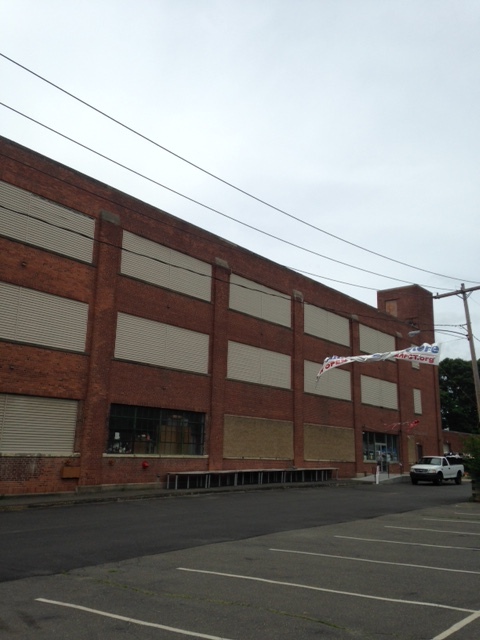 Back then, when I listened to Lilys and Monsterland, I’d wonder what other magic might be happening at Studio .45, a suite of rooms in the old Colt Armory building in Hartford. The studio, like the three clubs I just mentioned, is gone now, too, but Mike Deming is still in the music business, designing and marketing a line of studio compressors and preamps with his new company, CharterOak Acoustic Devices. A good Connecticut name. When I listen to “Crestfallen” and “Dimmest Star” and other favorite tracks from Overcome by Happiness, I think I remember specific places and friends from twenty years ago, but then I realize that the memories I have of this album will eventually be locked, here and now, in this present, in Chicago, in 2015. But I can’t resist the pull of that other time, the time I think I remember, when Tris, my basisist, and I ran into Bruce Tull and the rest of the Scuds outside T. T. the Bear’s in Cambridge in 1997. They were playing the Middle East. They’d pulled up in a van. Tris knew Bruce from grad school at UMass Amherst. They looked surprised but happy to see each other. Bruce, I remember, looked tired. Joe Pernice might have been there, too, but I don’t know if I met him. Maybe he was still in the van, or getting a falafel sandwich at the Middle East. Or maybe we said hello. Not for sale. Surrender on demand. I keep repeating those lines to myself like they have some kind of meaning, like magic. I’d love to be dramatic, tell you that the Connecticut/Western Mass. scene in those days wasn’t for sale, wouldn’t surrender anything, was too punk for you, so that’s why you don’t remember these bands as fondly as you remember Nirvana or Smashing Pumpkins or Liz Phair. But that wouldn’t be true either. Mostly, I miss my friends, and I miss the curve of 91 north as it follows the Connecticut River through the Pioneer Valley of Massachusetts. And I wish Mike Deming were still making records, and I hope someone someday puts together a collection called The Best of Studio .45. I think that’s what I’m hearing when I’m hearing “Crestfallen” and the other lovely songs on Overcome By Happiness: not Connecticut in the 1990s, but the stillness of my apartment, now, as I write this. And what I think I’ll remember of these songs in another 20 years. And those string arrangements. Those strings. 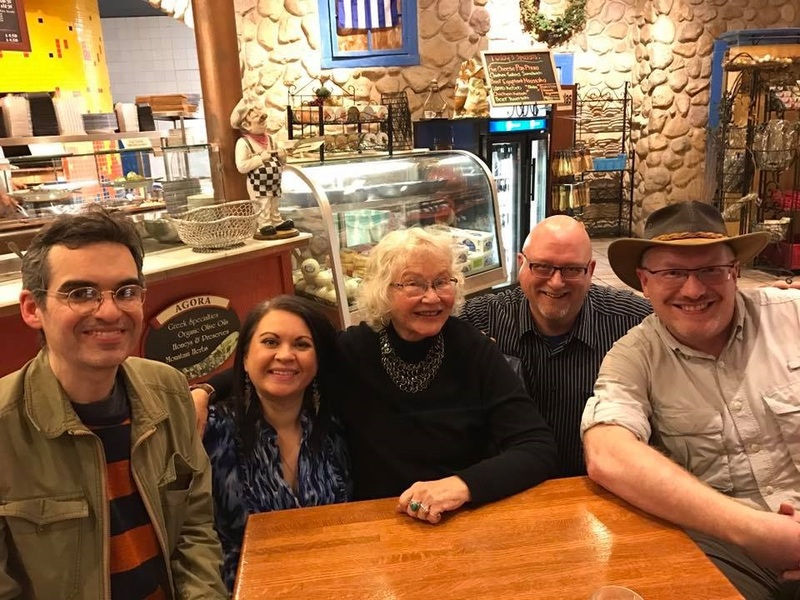 I mentioned in my post from earlier this week that I’d be talking with Derek Parker Royal, Andy Kunka, and Gene Kannenberg, Jr., on their long-running podcast the Comics Alternative. The show is already online right here. While you’re visiting their website, take a listen to some of the other shows they’ve done. From artist interviews to reviews and discussions with other writers and scholars, the Comics Alternative offers up an eclectic mix of conversation about all kinds of graphic narratives. In this episode, we talk in more detail about the research, writing, and editing process, and Gene points out the tribute to the Dr. Manhattan chapter of Watchmen that appears at the end of the book (Watchmen? Really?! Yep. It’s there.) This one was just as much fun to record as the talk with Emmet O’Cuana for Deconstructing Comics a couple of weeks ago. Meanwhile, frequent Comics Alternative contributor Sean Kleefeld writes about Steamboat and his response to the character on his website. He raises some good points about issues of representation in comics of the 1940s and 1950s and urges readers and scholars to study these images and their consequences more fully. 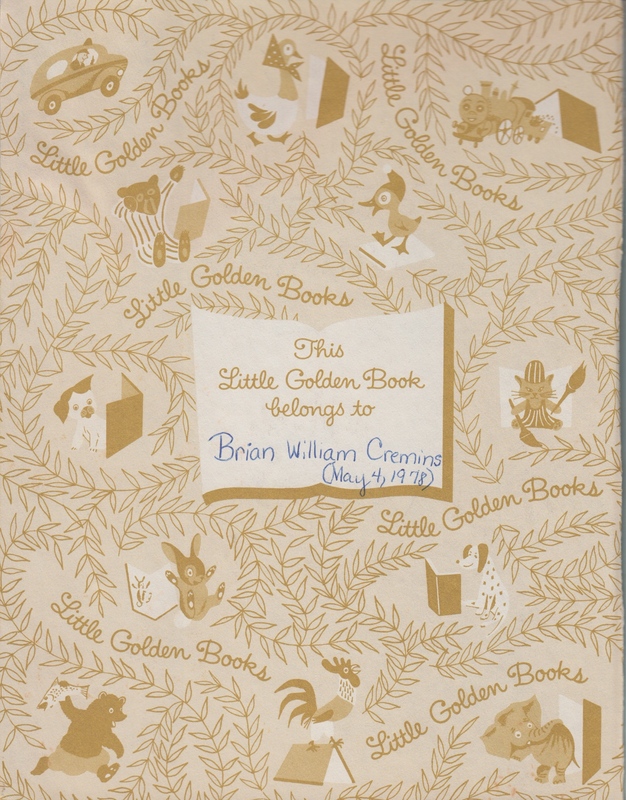 So does this mean I got started on May 4, 1978 with this 47 cent book from Bradlees?! No wonder it took me so long. I couldn’t even read in 1978! In a segment from Ken Viola’s 1987 documentary The Masters of Comic Book Art, artist Bernie Wrightson sits in his studio. There’s an easel to his left and a picture window behind him. It must be late autumn. The trees outside the window are bare except for a solitary one in the foreground that still has its leaves. Beneath the white birch trees the earth looks brown and barren. In fact, it looks like a landscape from one of Wrightson’s drawings or paintings, filled with intricate details that announce their presence slowly and only to those who look carefully. At the end of the interview, Wrightson, the much beloved comics artist who passed away this weekend at the age of 68, describes an image of true and complete terror. Horror is different things to different people, I think. To me–in spite of my drawings of monsters and the creeping dead crawling out of their graves and vampires and Frankenstein’s monster and whatnot–horror to me is an image of a well-dressed man standing on a corner waiting for a bus. And everything about him is absolutely perfect except there’s a spot of blood on his shoe. The first story that appears in the issue is “The Muck Monster,” first published in Eerie #68 in September 1975 and recently reprinted as an Artist’s Edition by IDW Publishing. In the story, a mad doctor tries to create a Frankenstein-like being, but the monster resists. Although he is now awake, the creature, in a caption on the story’s second page, explains, “I resented his presumption upon a higher power. I resisted his attempts on my being!” In fact, he continues, he “did not want life!” Only at the end of the story, after a confrontation with his creator, does Wrightson’s monster embrace what he is. But what is he, anyway? That’s what he’s been trying to figure out since the first page of the story. I suggested earlier that Wrightson is a master of the grotesque, but the monsters in his world are descendants not just of Poe and of the stories in EC Comics but also of Sherwood Anderson’s characters in his 1919 collection Winesburg, Ohio. You won’t find Anderson’s short stories–which had a tremendous impact on a young Ernest Hemingway–in the reading list for a course on horror fiction. Nonetheless, Anderson opens his collection with a framing device in which an elderly writer offers a definition of the grotesque that might apply to Wrightson’s work. At the dawn of myth and history, the writer suggests, “were the truths and they were all beautiful.” But humanity didn’t quite know what to do with all of that beauty. The old man, after years of carefully observing his friends and neighbors, developed a “notion that the moment one of the people took one of these truths to himself, called it his truth, and tried to live his life by it, he became a grotesque and the truth he embraced became a falsehood” (Anderson 23-24). 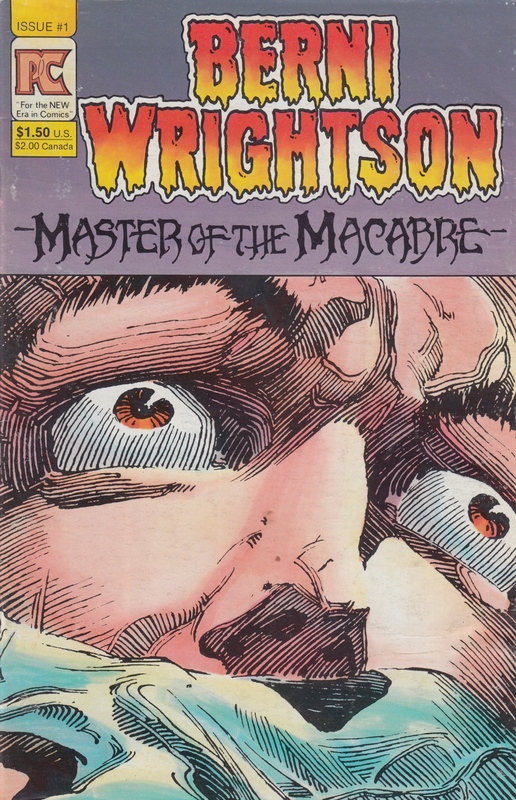 Wrightson’s vision of the world is closer to Anderson’s or to Mary Shelley’s than, say, to Stephen King’s. Only in surrender is it possible to find that original truth and the beauty that defined it. Wrightson understood that a grotesque must always remind us of the wonder of just living in the world, of asking questions, of being. “Does that which is go on forever?” asks the Muck Monster before he surrenders to time and nature. Maybe. Or, as he asserts, “Perhaps!” I’d like to think that it does. 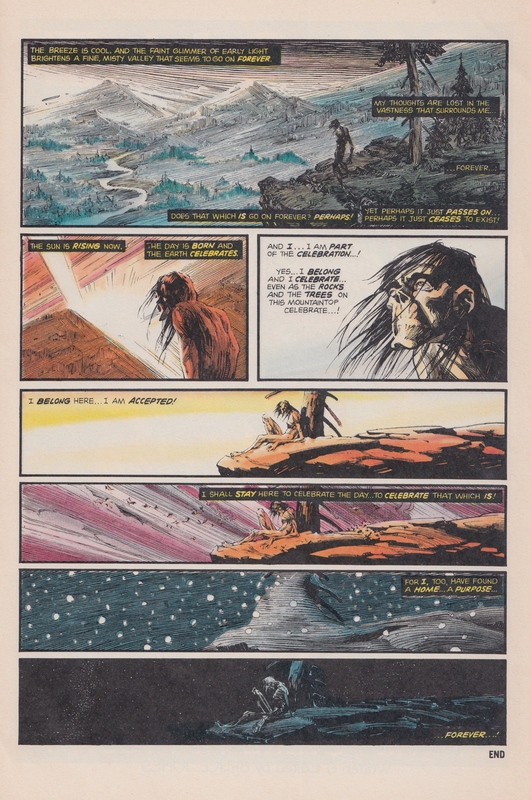 And, when I revisit Wrightson’s comics, and read them with the same delight I did the first time, I get a sense that the “celebration” the monster longs for is never too far away. Anderson, Sherwood. Winesburg, Ohio. New York: Penguin Books, 1983. Print. Clare, John. John Clare: Poems Selected by Paul Farley. London: Faber & Faber, 2007. Print. Viola, Ken. The Masters of Comic Book Art. Ken Viola Productions, 1987. Video. Wrightson, Bernie. Berni Wrightson: Master of the Macabre no. 1 (June 1983). San Diego, CA: Pacific Comics. Print. Captain Marvel and the Art of Nostalgia…on the radio, online, and on (a very small but meaningful cross-country) tour! 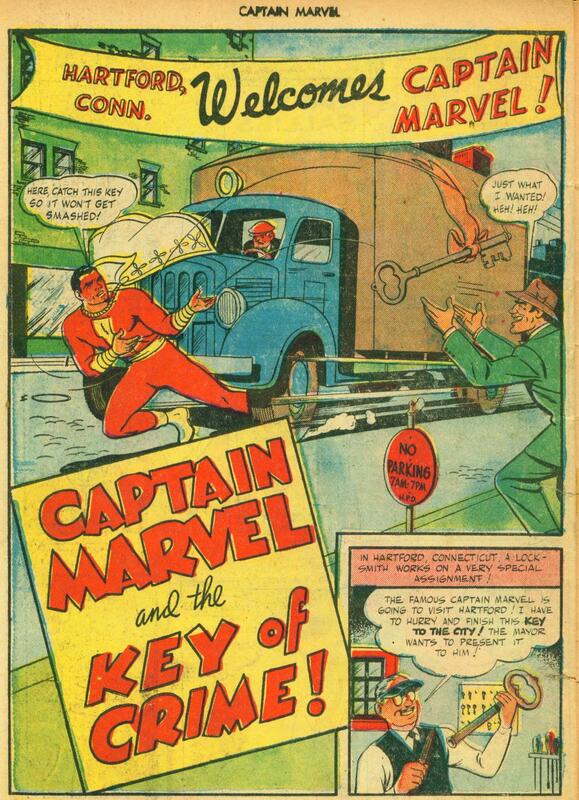 If you’ve read Captain Marvel’s adventures from the 1940s, you might remember the many stories in which he visited cities across the country. While I won’t be traveling as much as Billy and his alter ego did 70 years ago, I do have a couple of lectures coming up at the end of March. I’ve been joking that the week of March 27th will be my book tour–two dates only, so be there! I’ll start on my home campus of Harper College where I’ll be doing a lecture in our Drama Lab (Building L, Room 219), right down the hall from our Picasso sculpture. I’ve told you we have a Picasso on campus, right? If you haven’t seen it, you can visit it after we do a raffle for a copy of my book and for a couple of issues of DC’s Shazam! from the 1970s. Since at least two classes of English 102 students will attend, I’ll focus on my research process and on the writing and editing of the book. This event is free and open to the public, so tell your friends. You can also read this recent article about the book at Harper’s Academy for Teaching Excellence website. A few days later, I’ll be presenting another lecture called “Comic Books, Captain Marvel, and the Art of Nostalgia” in my hometown of Waterbury, Connecticut at the UConn-Waterbury campus, where I worked in the late ’90s and early 2000s as an Admissions Counselor and Writing Center coordinator/tutor. The campus’s Osher Lifelong Learning Institute is sponsoring the event. I should mention that technically I grew up in Oakville, CT, but we were pretty close to the border with Waterbury. And I was born at Waterbury Hospital and graduated from Sacred Heart High School. And, since the city appears in Death of a Salesman and in “The Secret Life of Water Mitty,” there’s a better chance you’ve heard of Waterbury and might even know where it is. Email the OLLI office at UConn or contact me directly if you need more information on the lecture. Meanwhile, I’ve recorded a couple of interviews about the book. I spoke with Larry Corley at WQNA radio early in January. I don’t think his shows are archived, but here’s a link to the station’s Facebook page if you want to take a look. WQNA is based in Springfield, Illinois. Two weeks ago I spoke with Emmet O’Cuana for the Deconstructing Comics Podcast. As he mentions in the description for the show, just posted this morning, we had a great conversation on everything from Beck and Binder’s aesthetics to Svetlana Boym’s theories of nostalgia and our mutual admiration for W. G. Sebald and his writing. I also admitted my affection for Dwayne “The Rock” Johnson and my hope that, one day, he and I will meet so I can give him a copy of the book. And, for the record, I want him to play Black Adam and Captain Marvel! 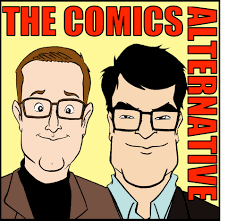 Tonight I’ll be speaking with Andy Kunka, Derek Royal, and Gene Kannenberg, Jr., for the Comics Alternative podcast. I’m sure we’ll all have plenty to say about Beck and Binder, but I hope Gene and I also get to talk about our time as graduate students at UConn in the 1990s and early 2000s. As I’ve mentioned many times, I don’t know if I would have started writing about comics if I hadn’t met Gene and Charles Hatfield in the second year of my graduate program. Though I’d written letters to the Comics Buyer’s Guide in the 1980s, and turned in a couple of papers on comics in high school and again in college, their friendship and support made Captain Marvel and the Art of Nostalgia possible. More updates to come, but for now I’ve got to get back to work on these lectures! 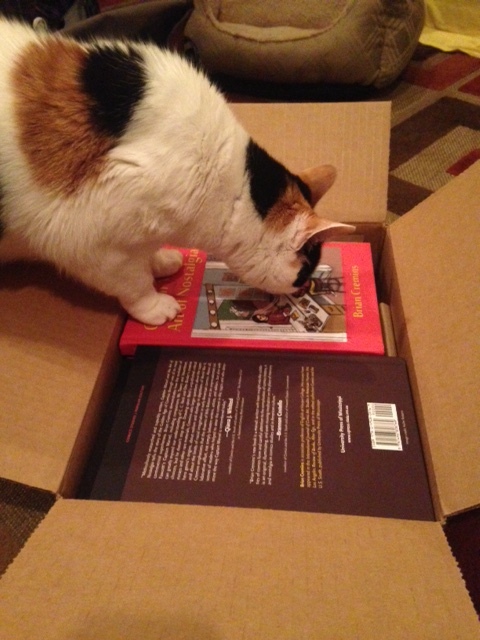 As you can see from this image, our cat Rosie carefully inspected the author copies of Captain Marvel and the Art of Nostalgia that arrived from the University Press of Mississippi last week. After she determined that each copy was ready for the public, I began mailing them out on Christmas Eve. Once I get over the holiday bug that struck me down over the weekend, I’ll begin adding regular updates and new material to this site about the book. My fellow Irishman Emmet O’Cuana has the book’s first review up at the site Hopscotch Friday. I wrote an article for the new issue of Alter Ego/Fawcett Collectors of America about Steamboat. The article is based on Chapter 4 of the book. You can read a short preview here or order a copy from the TwoMorrows website. Meanwhile, you can order the book from Barnes and Noble or directly from the UPM website. Amazon should have it in stock by the first week of January. Please also support your local bookstore! Here in Chicago, places like Unabridged Books and the Seminary Co-Op, two of my favorite shops, would be happy to order a copy for you. Or why not try Quimby’s or Chicago Comics or Third Coast Comics? Diamond should have it in the next couple of weeks two–despite the fact that there’s an error on their site listing it for June 28, 2017! (I am a perfectionist, believe me, but I have my limits). And, of course, if you’re here in Chicago, I will be happy to sign your copy. I might even draw something in it. Thanks for reading. More updates to come. So, it’s almost here! 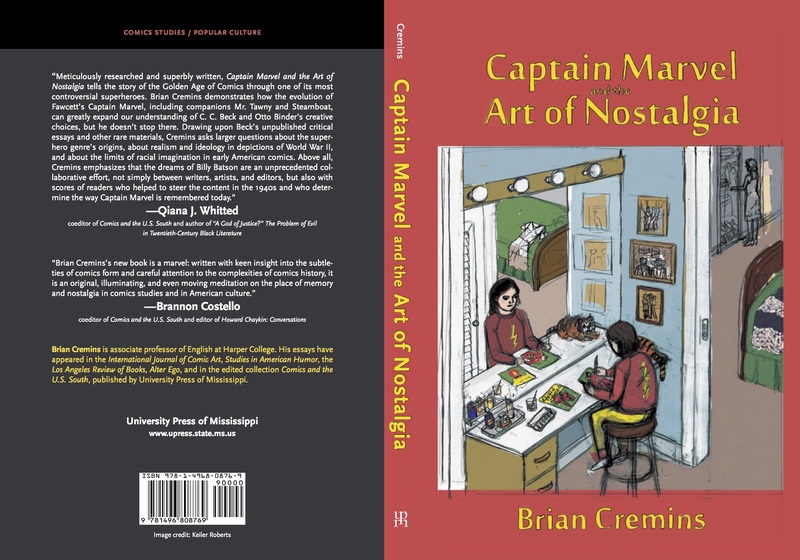 I started working on what would become Captain Marvel and the Art of Nostalgia, from the University Press of Mississippi, in the spring of 2011. I wanted to write a book modeled after Paul Schrader’s Transcendental Style in Film, one of my favorites. I thought I’d select four or five artists (or writer/artist teams) and study the spiritual dimension of their work. In that original outline, I included chapters devoted to John Porcellino, Carrie McNinch, James Sturm, Edie Fake, and C. C. Beck and Otto Binder’s Captain Marvel. Then I wondered, will anyone but me want to read this?! I ended up writing the essays on King-Cat, The Revival, and Gaylord Phoenix, three of my all-time favorite comics. Then, as I started my research on Beck, I thought, should I write a whole book on Fawcett’s Captain Marvel? I wasn’t much of a fan as a kid. I knew the character mostly from the Saturday morning live action TV show, which I always dreaded, because, on our local CBS affiliate in Connecticut, it followed the cartoons, which meant that Saturday morning was coming to a close. The only upside? My dad would probably make a grilled cheese sandwich for me. But sometime in the late 1990s I found a stack of DC’s Shazam! revival from the 1970s at one of Hal Kinney’s comic book shows at the Elks Hall in East Hartford, Connecticut. I started to pay attention: I adored Beck’s clean, simple drawing style, and the reprints of Fawcett’s Golden Age stories introduced me to Otto Binder’s witty, strange, and charming scripts. Soon, I began to notice affinities between that research and other work I’d been doing on my maternal grandfather, Nunzio Stango. Born in 1913, he was a World War II vet who joined the Army around the same time that Billy Batson, Captain Marvel’s alter ego, signed up in the summer of 1942. My grandfather and his Army War Show buddies show up in Chapter 3. In writing my first book, I’d found my way back to the very first collection of stories I’d fallen in love with as a young reader. But that’s how nostalgia works, right? That process, as a friend recently reminded me, is what Mircea Eliade called the “eternal return,” a series of rituals that (if we’re lucky) lead us back to Saturday morning, to the Zenith TV, to the ghosts in the hydrangea tree, to the plastic toy soldiers buried in the garden, to the Andrews Sisters and the clock radio, to the toy box filled with comic books. You know what? Music does the work better then words, sometimes. I wish I’d found a footnote for Return to Forever’s great tune “Captain Marvel.” But since I didn’t have space for it, you can listen to it right here as you take a look at Keiler Roberts’ drawing for the book’s cover. Meanwhile, over the next several months, I’ll post regular updates about the book, including more material and ideas that didn’t make the final cut. I hope you’ll find something you like. Or, you know, if you need a soundtrack that matches the title for this post, here’s “Soon” by My Bloody Valentine. In a few hours, I’ll be headed to Columbia, South Carolina for the 2016 International Comic Arts Forum at the University of South Carolina. On Saturday I’ll be presenting a paper on a panel called “Comics Readers” with three amazing friends and scholars: Qiana Whitted, Carol Tilley and Chris Pizzino! Can’t be there? Here’s a little preview of my paper, which is based on some material from my upcoming book from the UP of Mississippi, Captain Marvel and the Art of Nostalgia. I’ll also be moderating a panel on Thursday and giving out official Comics Studies Society buttons and bookmarks at the ICAF info table over the next couple of days (haven’t joined the CSS yet? You should before the founding membership drive closes tomorrow, April 14th!). Come by and say hello! 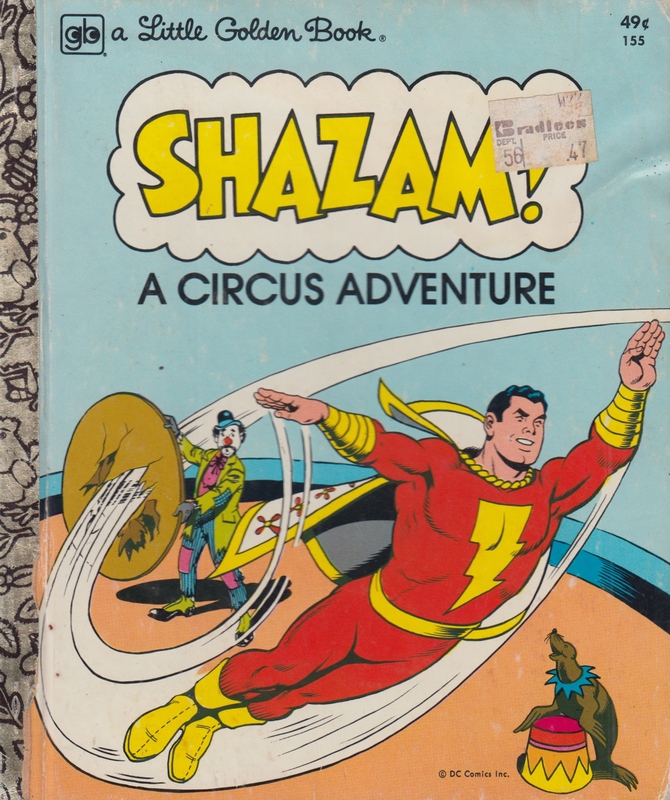 My paper features a big cast of supporting characters: Billy Batson, Captain Marvel, Mr. Tawny, Harlan Ellison, Roy Thomas (who’ll be at ICAF on Saturday, I hope with one of his capybaras), Isaac Asimov, C. C. Beck & Pete Costanza, Henry Kuttner, and Hoagy Carmichael (to name just a few). Email if you’d like to read the rest of it (or for the Works Cited). Now I better go feed the cats and finish packing. 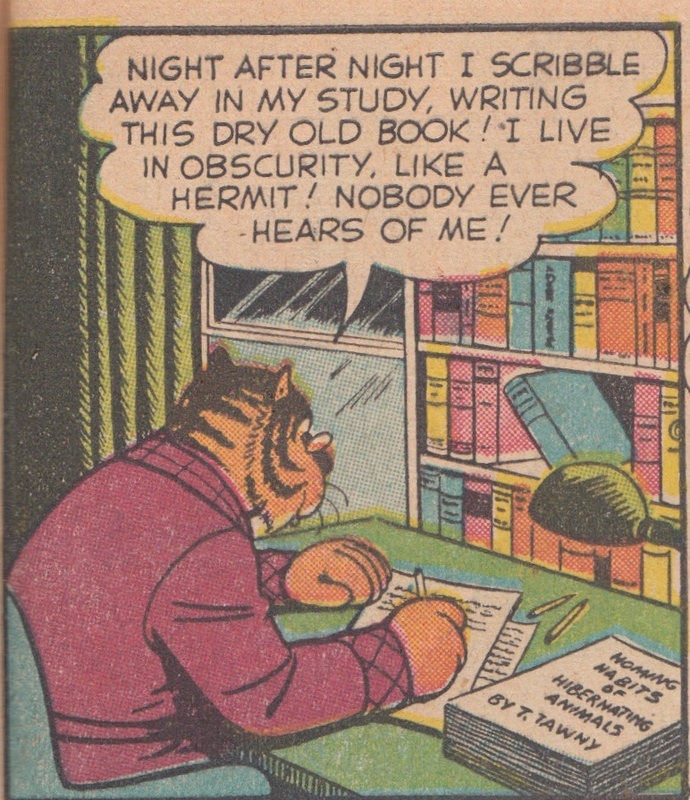 Even a talking tiger gets writer’s block sometimes. 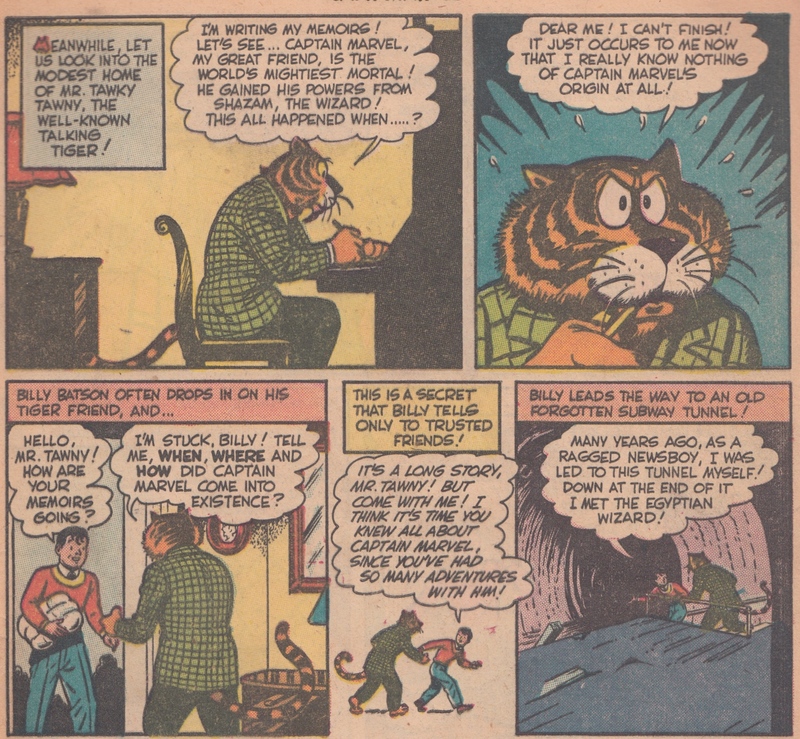 For Billy Batson’s best friend Mr. Tawny, it happened often, first in “Captain Marvel Battles the Plot Against the Universe” from September, 1949. Hard at work on his memoirs, Tawny realized that his story would not be complete without the facts on Captain Marvel. Billy, acting as a kind of magical research assistant, offered a first-person account of the stranger, the subway tunnel, and the mysterious train ride. In an essay about the real-life counterparts of Captain Marvel’s cast of characters, Beck, Binder’s friend and long-time collaborator, revealed that “Mr. Tawny, the talking tiger, was actually . . . who else? Otto Binder!” (“The Human Quality” 29). The writer, he added, “had a lot of fun laughing at himself in the Mr. Tawny stories” (29). Binder filled Tawny’s adventures with autobiographical traces that offer insights into the complex relationship between comic books and nostalgia. Perhaps this was because the character, as Binder noted in a 1964 letter to Roy Thomas published in the fanzine Alter Ego, “lent himself more to orthodox concepts” (“Special!” 111). That is, Tawny struggled with an adversary Captain Marvel never had to face: time itself, and an inevitable descent into middle age. Binder anticipates one of the challenges scholars continue to face: how does one tell this story? And what role has nostalgia played in shaping the history of comics? In Comics Versus Art, Bart Beaty reminds us that key members of what he calls “the second wave of organized comic book fandom” in the United States often “wrote nostalgically” and with great affection about comics from the 1940s and 1950s (154). These fans, many of whom admired and corresponded with Binder, also, as Beaty points out, were instrumental in the development of “comic book specialty stores, comic book conventions, fan magazines, comic book price guides, and even publishing houses” (154). At the close of the Binder biography Words of Wonder, Bill Schelly claims the writer as a father figure whose “nurturing and supportive actions” (234) inspired several important figures in this “second wave” including Richard and Pat Lupoff, Jerry Bails, Bill Spicer, and Roy Thomas. In the early 1970s, Binder and his wife Ione, still grieving the tragic loss of their daughter Mary, continued to welcome fans, including a young Frank Miller, to their home in upstate New York (Schelly 218-219). When he died in 1974, Binder also left behind an archive of material—letters, scripts, unpublished essays—some of which are now housed at the Cushing Memorial Library at Texas A&M University. That wealth of material on comics history, however, is only part of Binder’s legacy. For Binder, those conversations with fans in the 1960s no doubt brought back fond memories of his old friends and colleagues at Fawcett. By sharing his memories with this new generation of amateur historians and aspiring writers and cartoonists, Binder introduced this “second wave” to a critical discourse on comics that had its roots in the close-knit community of editors, writers, and artists with whom he’d worked in the 1940s and early 1950s. In the introduction to The Future of Nostalgia, Boym argues that “[t]he nostalgic desires to obliterate history and turn it into private or collective mythology, to revisit time like space, refusing to surrender to the irreversibility of time that plagues the human condition” (xv). In his Alter Ego letter, Binder cautions against any idealization of the past. The “second wave,” however, set out to preserve and celebrate what it could of that “collective mythology,” to borrow Boym’s phrase. In the introduction to the first issue of The Golden Age of Comics from 1982, for example, Don Thompson and Maggie Thompson describe their vision for “an ideal world” where “nothing would ever go out of print. It should be possible for fans and casual readers alike to obtain the complete Action Comics, the complete works of Milton Caniff, and the entire run of any comic book, comic strip, or magazine at libraries” (4). What they call a “Utopian dream” is now coming true, not only because of websites like The Digital Comics Museum but also because of institutions such as the Billy Ireland at Ohio State and Randall Scott’s Comic Art Collection at Michigan State. Binder and his alter ego Mr. Tawny, however, pose a challenge to these “utopian” visions. If, as Alan Moore once said as he outlined his ideas for his version of Marvelman (Mick Anglo’s British variation on Captain Marvel), “the central appeal of nostalgia is that all this stuff in the past has gone” and is “finished” (Moore 24), then what pleasure is left to us once the past, and all its mysteries, have been revealed to us? Some ghosts are best left alone. Or, as Binder himself wrote in another letter to his old friend Julius Schwartz published in Shazam! No. 4 in 1973, a little over a year before his death, “The comics seem like some long-ago dream and I have no slightest hankering to go back to them, in case you’re wondering” (“Shazamail!”). That “long-ago dream” might provide just the illumination Binder believed necessary for any “rational picture” of comics and their history. It has all the elements of a lost Binder and Beck classic: time, memory, loss, redemption. A little humor. Just imagine: “Captain Marvel, Mr. Tawny, and the Long-Ago Dream.” I like it. "A walking translation on a street of lies...."